The Water Without Borders? Policy Briefs are now available to download. The briefs, titled: “Flashpoints and Collaboration: How problems can inspire innovative solutions for Canada, the US and the governance of shared waters” are the product of an ongoing project, Water Without Borders? funded through the Walter and Duncan Gordon Foundation. The forthcoming book, Water Without Borders? Canada, the United States and Shared Waters edited by Dr. Emma S. Norman, Dr. Alice Cohen, and Dr. Karen Bakker will be released early next year through University of Toronto Press. It is our pleasure to announce the promotion of Dr. Leila Harris to Co-Director of the Program on Water Governance. Dr Harris brings a wealth of international, interdisciplinary research experience on water, gender, and the environment. We look forward to her playing a leading role in the Program’s international work. Congratulations Leila! The Fisheries Act is Canada’s strongest environmental law, mainly because it prohibits what’s known as HADD – “the harmful alteration, disruption or destruction of fish habitat”. So when the government plans to dismantle this protection, it’s time for Canadians to say they have HADD enough. OFF TRACK, ONSIDE? REALISING THE WATER AND SANITATION MDG MAY BE POSSIBLE BUT WHAT WILL IT ACHIEVE? Access to water and sanitation for all is central to achieving global justice for poor women and men. Yet the global aid architecture is still straining to solve what appears on the surface a simple problem: how to provide water and sanitation to the planet’s population. Despite successive global declarations and efforts, in 2008 over 2.6 billion people still lived without access to improved sanitation facilities and nearly 900 million people received drinking water from unimproved sources. At the core of this appalling situation is a global failure of collective action, despite repeated principles, declarations and meetings. As the global community rushes to mark the end of the Global Freshwater Decade 2005-2015 and the MDGs, it is worth pausing and looking at a range of contested pathways from past to present. Past lessons suggest that the wider global water and sanitation community needs to rethink approaches and emphases, shifting from targets and global pronouncement to issues concerning sustainability, global/local mismatches, contested knowledges, equity, politics and power. Lyla Mehta is a Research Fellow at the Institute of Development Studies, University of Sussex and an Adjunct Professor at the Norwegian University of Life sciences. She is a sociologist and her work has focussed on the politics of water and sanitation, scarcity and forced displacement. She uses the case of water to address conceptual debates concerning rights, access and power/knowledge interfaces in environment and development. She has been involved in advocacy work on water, dams and development issues with NGOs and social movements in India and Europe. Her books include ‘The politics and poetics of water: naturalising scarcity in Western India’, ‘Displaced by development: confronting marginalisation and gender injustice’ and ‘The limits to scarcity: contesting the politics of allocation’. The Program on Water Governance is collaborating with a number of organizations to organize public events in Vancouver to celebrate UN World Water Day 2012. Click on the links below for further information, or contact Gemma Dunn (gemma.dunn@ubc.ca). 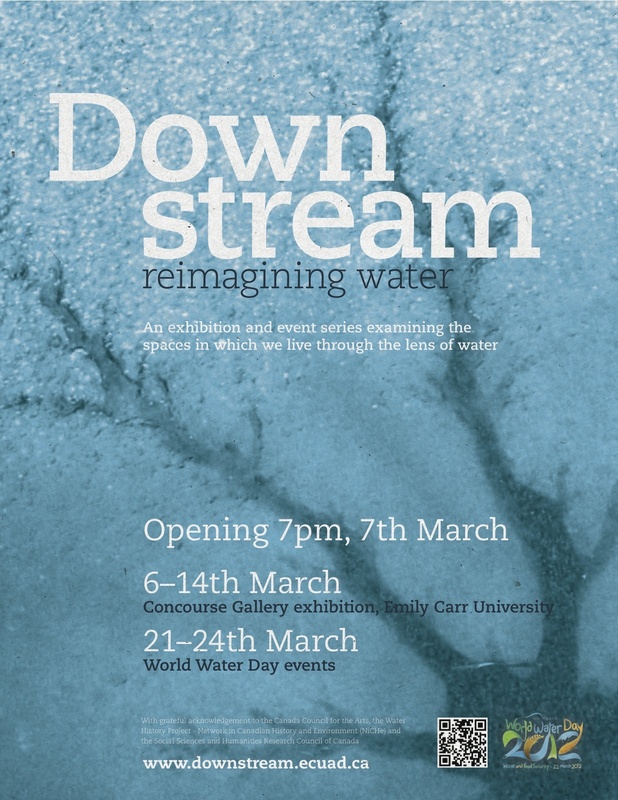 An art exhibition and event series examining the spaces in which we live through the lens of water. Visit http://downstream.ecuad.ca/ for more information. Opening by elder Florence James. 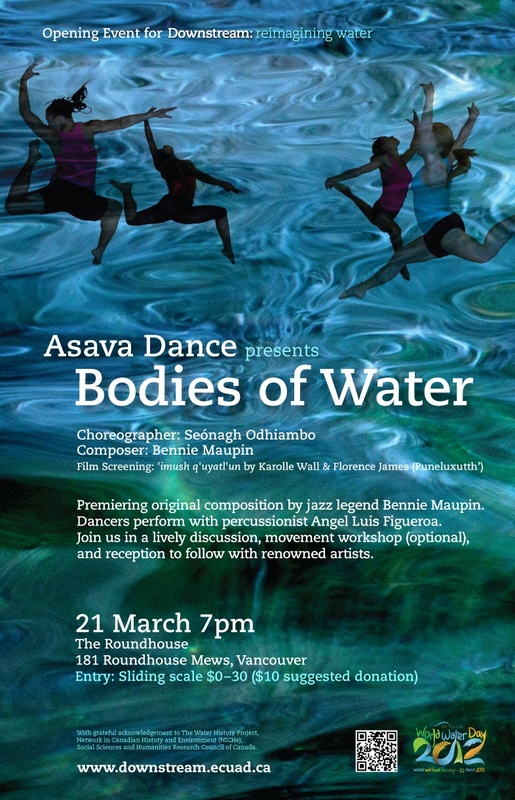 Public Dance Performance and Workshop by Seonagh Odhiambo and her troupe Asava Dance at the Roundhouse Community Centre. Plus screening of short film ‘imush q’uyatl’un – Florence James and Karolle Wall. Visit http://downstream.ecuad.ca/?page_id=337 for more information. Thursday March 22nd (8:30am-5:30pm): Canadian Water Resources Association & Engineers Without Boarders – all day seminar on water and food security at Performance Works, Granville Island. Featuring guest speaker Scott Niedermayer, former NHL defenseman and Freshwater Ambassador for World Wildlife Fund – Canada. For more information and registration click here. This event will be followed by “On Edge Readings and Special Screening” at 7pm at Emily Carr University of Art and Design (see below). THIS EVENT HAS BEEN CANCELLED!! The Global Transboundary International Waters Initiative and the Institute of Asian Research are hosting a lunch time discussion session on transboundary water issues. This will be held in Room 120, CK Choi building, UBC Vancouver Campus on Thursday March 22nd from 12:30-2:30pm. One exhibition and three events about globalization and migration along the Yangtze River in China. Lunch will be provided; please RSVP to globalethnographies@gmail.com by March 23. 5:30-6pm: Dinner. Food will be provided; please RSVP to globalethnographies@gmail.com by April 2. The finale to our four-year Water Security project was a series of events connected to the American Association for the Advancement of Science (AAAS) Annual Meeting in Vancouver, BC, February 16-20, 2012. 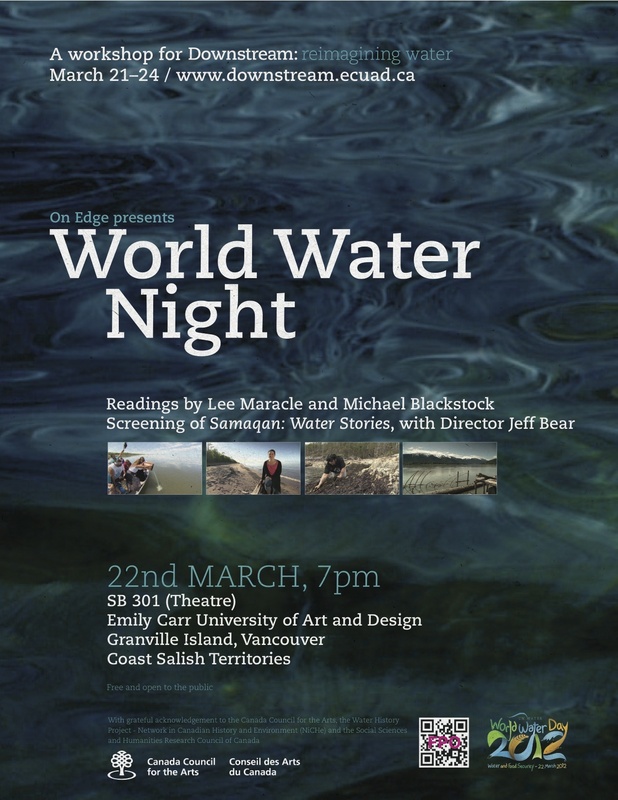 On the 17th February 2012, the University of British Columbia’s Program on Water Governance held a panel event exploring Water Security in Canada. Water is arguably our most critical resource. But how secure is Canada’s water? What are the greatest threats we face? And what should be our priorities for management and conservation? Invited experts explored these questions, and presented views on current and future water issues in Canada. The presentations were followed by a moderated discussion with audience members. – Dr. Judy Isaac-Renton (Public Health Laboratory Director, BC Centre for Disease Control). 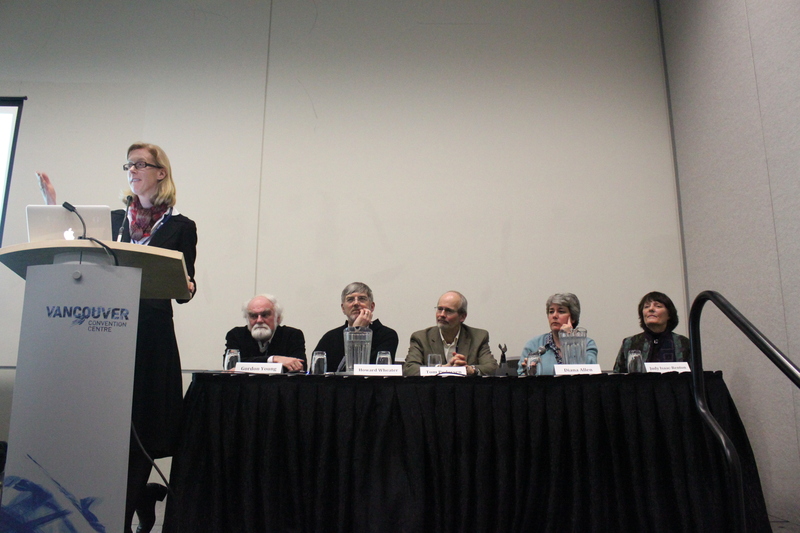 The panel was moderated by Prof. Karen Bakker, Director of the UBC Program on Water Governance (and author of Eau Canada: The Future of Canada’s Water) and Prof. Mike Church (University of British Columbia). “Water Portraits” by Peter Holmes were also on display. Water Security in Canada was a free event open to the public, held in conjunction with the 2012 Annual Meeting of the AAAS in Vancouver. It took place in room 109, Vancouver Convention Centre, West Building on Friday 17th February from 7:30-9:30pm. 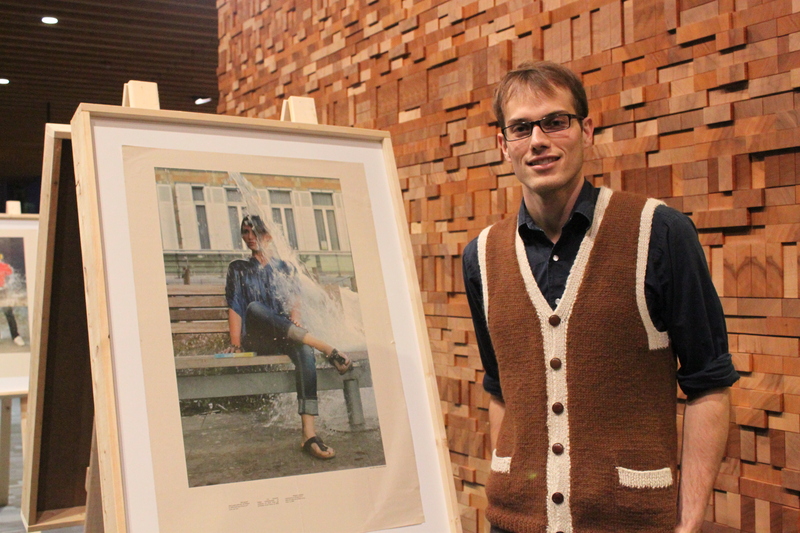 Emily Carr University of Art and Design invites artist to hare their work investigating how perceptions of water shape our experiences with it. It’s been said that wars of the future will be fought over water. Alternatively, however, water could form a path to peace. If so, what would this look like? If we are in a perpetual collaboration with water, how might this perception or acknowledgment change us? Spaces (and bursaries) are still available for the cutting-edge “unconference” on collaborative watershed governance! The event, “A Water Gathering: Collaborative Watershed Governance in BC and Beyond – Solutions Forum,” will take place January 26 to 27, 2012 at UBC Robson Square, Vancouver. The goal of this gathering is to provide participants with practical knowledge and skills for developing and maintaining collaborative processes, and to build new and strengthen existing networks. Participants will identify the skills essential for collaborative engagement and the necessary steps for realizing new forms of governance. Drawing on successful stories of change, the gathering will focus on what can be done and how to do it. The POLIS WSP is helping organize and deliver the event, hosted by the Pacific Business and Law Institute and the Summit Institute. For more information or to register call 604-730-2500 (local) or 877-730-2555 (toll free) or visit www.pbli.com/933.